The technical picture for spot silver remains messy at present as we continue to consolidate between $17.26 to the downside and $18.50 to the upside with the short term tone certainly bearish at present. 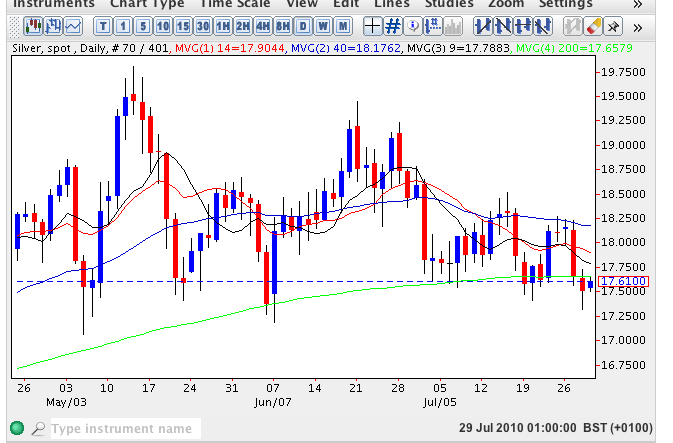 Yesterday’s price action for spot silver breached the 200 day moving average with the close of the session also ending below this key indicator adding further to the bearish sentiment at present. However, it should be noted that as we are trading in a channel at present the lower wick of yesterday’s candle suggests that we could be touching the bottom once again and see a bounce higher in due course to test the upper level of the channel once again as spot silver prices continue to move sideways. A sustained break above $18.75 per ounce will give us a clear signal that the channel has been breached, but anything else than this will suggest a period of further sideways consolidation.